Because your garage door is a complex mechanical system comprised of various moving metal parts and electrical components, it will need to be repaired from time to time due to some type of problem. However, while some issues can be difficult to avoid, all it takes is regular maintenance to prevent the majority of problems. It's very important to have the door balance tested regularly to ensure that he springs aren't overstraining or growing too weak to support the necessary weight. Adjusting these units can be dangerous, as there is a high amount of tension involved, so you're better off letting professionals like our specialists handle it. 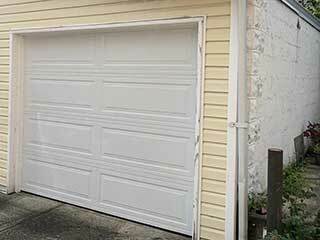 Your garage door opener needs to be able to detect when an obstacle gets in the way. That's why it's very important that the photo electric eye sensors it uses are correctly aligned with each other. If they get knocked out of alignment accidentally, the door may start reversing, or will fail to do so when it needs to. The former would be very annoying, and the latter would be downright dangerous. That's why we make sure to test the safety sensors during every maintenance visit. In addition, we also check the auto-reverse mechanism which senses resistance and ensures that the opener reverses the door when it comes into contact with an obstacle. It's important to use the right type of substance when performing garage door lubrication maintenance, as the usual WD-40, while suitable for rust removal, isn't designed for this purpose. We use either white lithium grease or silicone-based lubricant and apply it to everything from the steel rollers and the hinges to the rail and the torsion springs (provided that your door has them). All of the system's moving metal parts can benefit from this type of service, and the longevity-contributing effects are definitely going to be worth it in the long run. Since your garage door is a major part of your home and a serious investment, why let its condition degrade when you can have a professional see to it that it is properly maintained. This can actually save you money on preventable repairs, and reduce the likelihood of an accident. Get in touch with our team here at Garage Door Repair McKinney to ensure your system is well taken care of.